Here at the LA Injury Group, we have an entire LA personal injury lawyer team to take your slip and fall case. The phrase “slip and fall” sounds more innocent and innocuous than these injuries usually are. They can be devastating, tragic injuries. When these happen, you’re likely to not know what to do or how to recover. We’re always glad to help. Schedule a free consultation, and we’ll sit down with you to figure out how we can best assist you in getting the compensation that you deserve for your pain and suffering. These are a few notes we can share on how to move forward after an accident. Right after you trip, fall, slip or otherwise come in contract with the ground, the first thing you should do is make sure that you’re OK. Your health is always the most important thing. Make sure that you are safe and secure before trying to move around and do anything else. When you fall and are hurt, you’re liable to get a rush of adrenaline. You could be in shock. It could seem like the most natural thing in the world to stand up and try to move. Take it from our LA personal injury lawyer team: sometimes the best way to help yourself is to lie still and wait for help to arrive. That being said, if you are able to do so, our LA personal injury lawyer team recommends seeking medical attention. Call 911, get someone else to — do whatever it takes to get medical professionals involved. After a fall, you aren’t likely to think straight, or to have complete control of your faculties. Medical professionals can come and ascertain exactly what happened. They can set you on the road to recovery quickly. Our team has seen it many times: someone slips and falls, and then they don’t get medical attention. Sometimes, this can be a misguided attempt to save money. It can even be a sign of “toughing it out,” or a fear of missing work. We strongly recommend against doing this. Even if you have to miss work for a period of time, that’s better than allowing your injuries to linger and reducing your earning power significantly. We’re happy to sit down with you and take your case, so that you get the compensation you deserve for lost wages and more. Your health is the most important reason to get medical attention. Another, less important but still critical reason to get medical attention is so that your injuries can be properly documented. Proper documentation of your injuries is incredibly important to your eventual case. Medical professionals and experts who examined your body and can show exactly what your injuries as well as what caused them can be invaluable to making your case all that much more compelling. Once you’ve gotten the medical attention that you need from a fall, our LA personal injury lawyer team strongly recommends reporting the accident. Let whoever is in charge of the property know that it happened. This is true no matter where it happened. Most people know to do this if it happened on the job, or in a public space, like a store or office. However, you should do the same thing if it happened at the house of a friend. This can be awkward and difficult, but getting a report can be critical. It’s recommended that you get the details in writing and make sure you have a copy of it. In fact, you might want to write up your own documentation as to what occurred, too. It’s easy to say “I’ll get the report later” or “I’ll write it down when I have time,” but it’s not always that simple. Forgetting key details over time is easy. Even the most important recollections, the ones that can help you to get the compensation you deserve, can be lost. Getting this initial report can help quite a bit. We mentioned earlier about taking pictures of the injuries that you have. That can come in very handy, but be sure to get other documentation as well. For example, you also want to get pictures of your injuries as they heal. Even internal injuries and catastrophic injuries can change over time. They can look less bad months later. That’s why it’s so important to get pictures of them right after the injury as well as later on. It’s easy to show how bad they were, which can help you to get the compensation you’re entitled to. There’s a lot of documentation you can get that can help your case. For example, in a slip and fall accident, you want to have several pictures of exactly where the accident occurred. You also want to have pictures of what you believed caused the accident. So for example, if you were walking down the stairs in a store the railing broke, then you would want a picture of the railing, the stairs, how high the higher floor was, how hard the floor was, any debris or other consequences of the fall that show your impact, etc. Just like with the pictures of your injury, if you can’t do it, that’s understandable. It is recommended that you get a friend or loved one to do it, though. That’s especially true of pictures for slip and fall crash sites, as those can change quickly. If it happened in a store, the store owner may try to move the evidence of the crash as fast as possible. If it happened outside, then the physical evidence could be washed away with precipitation. The faster you can get pictures of where you fell, the better off you will be. Writing everything down that you remember is a good thing to do. As soon as you have a moment to yourself, write down all that you can remember about your slip and fall accident. Anything you can remember, write it down (or type it up). It doesn’t matter where you write it or how, just that you have a record that accurately captures your memories and feelings in the moments before, during and after your accident. You also may want to get key details in this as well, such as the exact date, time and so forth of your accident. That can make the job of your LA personal injury lawyer team that much easier. Should you be able to salvage the clothes that you fell in, they can also contribute positively to your case. It’s one more piece of evidence that supports your version of the events, your truth, so treat them as such if you can. Putting them in a storage place that’s absolutely safe can come in handy later on. Your shoes, your clothing, maybe something you were wearing, like a watch or bracelet that broke – anything you had on your person that was affected by the injury should be kept safely somewhere. Here at the LA Injury Group, we have lawyers to deal with every kind of accident and injury imaginable. In the years we’ve been doing this, it’s been our honor to help so many people get the compensation they deserve for their injuries. 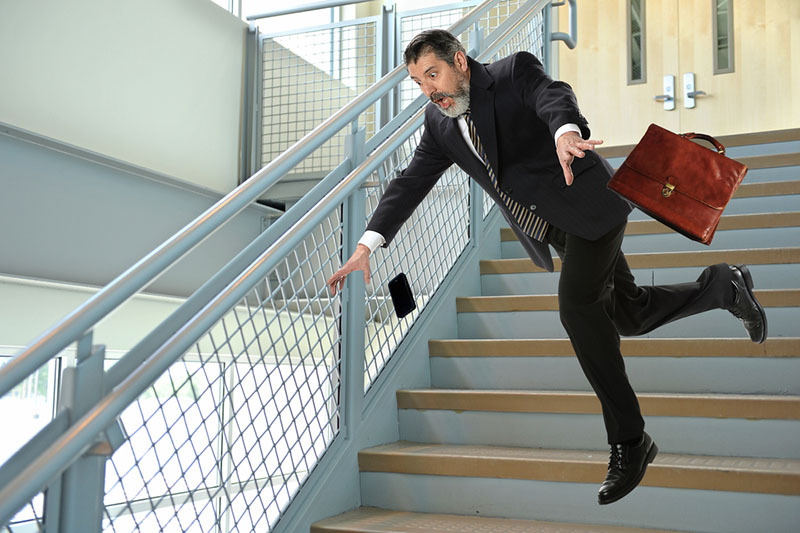 A slip and fall can be a particularly difficult kind of accident, as the true injuries from it might not be revealed for a few months or weeks. That’s why we always recommend not giving a statement, or telling the insurance company “I’m fine” or anything like that. You never know how bad the injuries might be. No matter what happens though, our LA personal injury lawyer team is ready to help. All you have to do is go to our website or give us a call at (818)210-4558.